The 1970’s heralded an era of newfound discovery and pride in Newfoundland culture and identity. The Folklore Department at Memorial University was thriving, people stopped being ashamed of the way they spoke, and rebelled against the newfie joke. We were in sync with a roots movement all over the world, as people began to look inward to their own people for inspiration. Noel Dinn, who had defied all odds and led his 60’s rock band, Lukey’s Boat, from Newfoundland to Montreal, on to London England, now began to assemble a group of musicians to carry on his vision of greatness, a band that would mingle his incredible powerful rock drumming with the music of the people. This group became Figgy Duff. But our source of uniqueness and strength was also our obstacle. There was no music industry on this windswept island in the North Atlantic in the 60’s and 70’s. The energy, courage and determination it took to blaze the Celtic trail across Canada and abroad in the 1970’s is utterly astonishing. In the very early years we traveled what seemed like every square inch of Newfoundland, seeking songs and music from people. We played community halls, clubs, festivals, kitchens, full houses, empty houses, to audiences indifferent, hostile, enraptured. In St. John’s we were eyed with suspicion by the folklore set who were re-discovering their uncles’ oil skins and boots and cape-anns battened down. We favored velvet and lace, and were vegetarians who smelled strongly of garlic and had a taste of poetry and copious amounts of fine wine. I remember a maze of diner parties with songs, music, laughter, and discussions far into the night of Blake and Yeats and Newfoundland nationalism, with Neil, Nelson, Genevieve, John, Patricia, Anita, Mike, Peter and more. 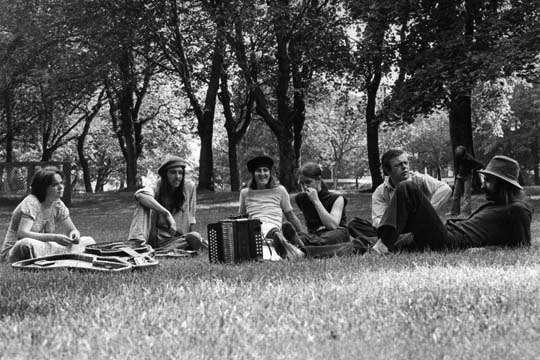 Some of the folk purists were downright outraged that their precious folk music was being tampered with by long haired “urban intellectuals” using drums and amps. But in those years we measured our success by the joy we brought to the people from whom we learned the music – who instinctively understood that you can’t cram a delicate and beautiful modal melody into a three-chord country format. The road became a way of life. We thought nothing then of picking up and hopping aboard the old Chevy van, perched on and between P.A. speakers, and driving to Toronto and beyond, gone for months on end, picking up gigs as we went. We crisscrossed Canada, US, and UK more times than I care to remember, occasionally on organized, well-paid tours, but mostly on a wing and a prayer. There was no “ Celtic” or “ Folk Rock” genre- no manager, no agent, no label. We were too electric for the folkies, and too folky for the rock clubs- blues bars seemed to get it mostly; but if we were lucky enough to strike the right venue- El Mocombo, Horseshoe in Toronto; Commodore in Vancouver, and a few other notables, it was magic. In later years we began to turn our attention more to original music. Noel in particular needed more forms of expression – his poetry and original music were crying for a voice. Times got hard – we never did figure out the “Music Industry”. The traditional players fell away to pursue their own interests – Dave formed “Rawlin’s Cross” and Kelly and Frank “The Plankerdown Band”‘ and on July 26, 1993, Noel Dinn passed away. But not before he had accomplished more in his 45 years then most do in a lifetime. In the last two years of his life he produced three albums with ex-members and close friends of “The Duff” – the exquisite “Color of Amber” with Anita Best, the joyful and spirited “Vive La Rose” and the dark and poignant “Downstream”.